Periods and child marriage: what is the link? Girls can start their periods as young as 10 or 11 years old. But what if your first period meant your parents thought you were ready for marriage? Or, if every time you had your period you missed school? For some girls, their periods mean the end of their education and the beginning of a lifetime of domestic work, pregnancy and even, violence. Going to school while on their period is difficult for many girls. Some can’t access or afford sanitary products and are forced to use rags or other materials instead. Without proper toilet facilities, running water or a place to wash their hands girls may struggle to manage their periods at school. They may fear accidents and feel too embarrassed to go to school, preferring to wait until their period is over. That is if they are even allowed to go to school in the first place. In many places menstruation is a taboo. Women and girls are sometimes seen as ‘dirty’ when they are menstruating and not allowed to leave the house. More research is needed about girls missing school during their periods but national studies from Brazil, India, Uganda and Ghana suggest at least 30% and up to 95% of girls report missing school due to their period. The impact of this absenteeism on girls’ ability to achieve at school is critical. They almost inevitably fall behind in their work and this can contribute to parents questioning the value of girls’ education. We know that when girls drop out of school they are overwhelmingly more vulnerable to child marriage. This is because some parents view marriage as the only option for girls or as a way of reducing household costs. When a girl gets married the ‘cost’ of looking after her passes to her husband and his family. Research has shown that when girls have access to appropriate sanitary products and facilities, and they understand what is happening to their bodies, they are more likely to stay in school and out of marriage. In some parts of the world, parents and communities view a girl’s first period as a sign that she is a woman – ready for marriage and motherhood. In reality, we know that girls are neither physically nor emotionally ready for marriage or pregnancy until adulthood. In fact, complications during pregnancy and child birth are the leading cause of death in 15-19 year old girls globally. Did you know? 23% of girls in India drop out of school completely after they start menstruating. Despite this, some parents decide to take their daughters out of school to be married after their periods start. Schools can become a hostile environment for girls entering puberty: they may face sexual harassment on their way to or from school or from their peers or teachers. Parents who fear that school is unsafe for their unmarried daughters may view marriage as an acceptable solution to protect them and their family’s honour. 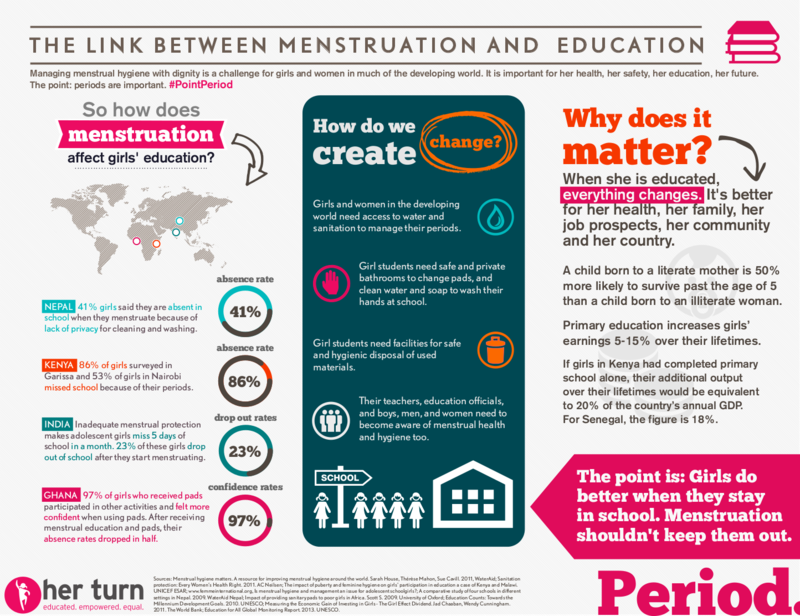 A girl’s first period is actually a crucial time for her to stay in school. As well as her education, it’s often the only place where she can learn about going through puberty and how to manage it. Sexual and reproductive health classes sometimes include information about child marriage and the alternatives to it. In 2014, Wateraid found that 70% of Indian school girls had no idea what was happening to them when they had their first period. They had dropped out of school before receiving any sexual and reproductive health education. For example in Uganda, Girls Not Brides member, Health Promotion and Rights Watch, uses menstrual hygiene education as an entry point for educating girls about the impact of child marriage. Their founder, Nankunda Hope, talks to adolescent girls about child marriage when they come to collect sanitary towels. Keeping girls in school and out of marriage. Period. With this knowledge, a girl’s period can be just a normal part of growing up – not a danger to her wellbeing and development.